Current understanding of genetic variation in lions (Panthera leo) is inadequate to guide many management decisions necessary for conservation of the species. 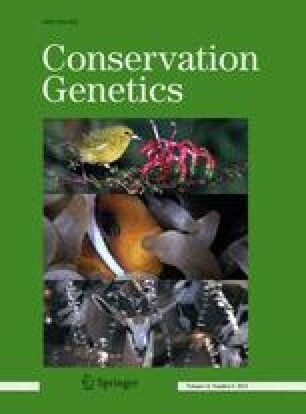 We studied sequence variation in the mitochondrial cytochrome-b (cyt-b) gene of 75 lions and nuclear variation at 11 microsatellite loci of 480 lions across 8 range states (Cameroon, Uganda, Kenya, Zambia, Zimbabwe, South Africa, Botswana, and Namibia) and 13 Lion Conservation Units (LCUs) plus two other unassigned sites (Cameroon and Zimbabwe). A total of 11 cyt-b haplotypes were found, whose variation follows an isolation-by-distance model. In combination with previously known sequences, the haplotypes document the close relationship, derived position, and limited variability of Asian and West and Central African lions relative to other extant lions. Both phylogenetic analyses and substitution networks identify two clades in Eastern and Southern Africa—one restricted to Namibia and South Africa and the other more widespread across the region. However, these analyses are equivocal on which of these is closest to the ancestor of modern lions. Microsatellite analyses showed high levels of variation within and among populations, subdivision among most LCUs, and evidence of isolation by distance. While rates of gene flow are generally low, admixture among lions in northern Botswana, Caprivi Strip (Namibia) and Zambia is apparent from STRUCTURE analyses. Conservation management plans should incorporate information on genetic variability and gene flow in delimiting management units and in guiding translocations of lions to minimize inbreeding and to control problem animals. The online version of this article (doi: 10.1007/s10592-013-0453-3) contains supplementary material, which is available to authorized users. We thank Luke Hunter and Lisanne Petracca for providing the GIS layer for the LCUs and Steve Judd for help editing the STRUCTURE diagram. JMD received partial funding through a grant from the Conservation Medicine Center of Chicago, from N. Alberts, and from Drs. Kalina. MBB thanks the Namibian Ministry of Environment and Tourism for its support of fieldwork in Etosha, Bushmanland, and the Caprivi Strip. He also thanks the Botswana Department of Wildlife and National Parks for its support of fieldwork in collection of all samples originating in Botswana. PAW thanks the Zambia Wildlife Authority for permission to conduct this research, the Professional Hunters Association of Zambia for their kind assistance with all aspects of the field work, and the Safari Club International Foundation, Dallas Safari Club, Shikar Safari Club and several individual donors for their generous support. BDP thanks the Earthwatch Institute (#5123, 2002–2009), Field Museum of Natural History (Barbara E. Brown and Marshall Field Funds), and Dr. S. Kasiki of the Kenya Wildlife Service for support and facilitation in the field. We gratefully acknowledge two anonymous reviewers whose comments improved the value of this contribution.